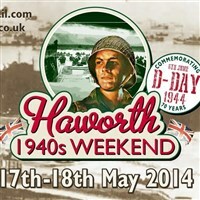 We help celebrate the 1940s in Haworth and experience the sights and sounds of this most patriotic of decades! The village comes alive during the weekend with locals and visitors alike dressing up in 1940s attire! There are a wide range of events to enjoy along with vintage vehicles, air raid warnings, the Home Guard, military memorabilia, plenty of 40s music and a WWII Spitfire Fly By!